Try out some of these scrappy Valentines projects. Keepsakes, momentos, gifts and food....love it all! Shabbychic Crafts shares a valentine cd and coupon holder complete with a set of Love Coupons that you can download for free! 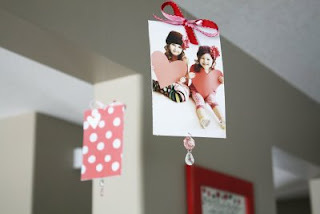 I am in love with these hanging valentines by Talia. A simple project that she created in no time at all with her young girls running around. There is a little 'how to' tutorial at the bottom too. She makes it seem all so easy. now if only i could take a picture like that i will be set..lol. Mmmmmmm cookies. Little Birdie Secrets makes chocolate dipped heart shaped cookies in a tin covered in pretty scrappy papers. I'm all about upcycling and food so i loooove this project! I'm reading: Valentines Scrapbooking ProjectsTweet this! Hello! Thanks for the compliment. Wow, you have a wonderful blog here. So many goodies to view. That is fantastic! Thank you!!! I love those hanging valentines! I'm totally making some! What a fun collection of crafts, so much to look at and be inspired by. Thanks for mentioning my felt countdown! WOWWW---what more can a girl say about this blog!!!--WOWWWW! !--i feel like i've found home---i love me some mini-albums--this blog is what i've been lookin' for---so you have a follower forever--by the way, i left something for you on my blog so go pick it up---you deserve it--hello to everyone and i look forward to meeting all of you as well---remain blessed!! !